Dental implants are not just a restorative procedure that can beautify your smile, but it's vital for providing your jawbone with the necessary strength. Dr. Brian Gniadek is here to help and advise you! Your dentist will insert a titanium post into the jawbone. 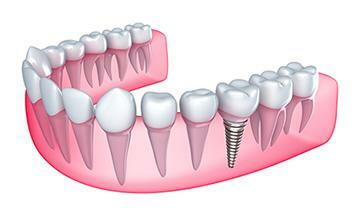 The titanium post acts as the new tooth root and is biocompatible. The doctor will then close the area and allow it to heal for a period of 3 to 6 months, while the process of osseointegration takes its full course. When you return, your Lindenhurst dentist will insert an abutment and place a crown over the abutment that matches the rest of your teeth. If you have questions or concerns, contact your Lindenhurst, IL, dentist Dr. Brian Gniadek today! Call (847) 265-9070.